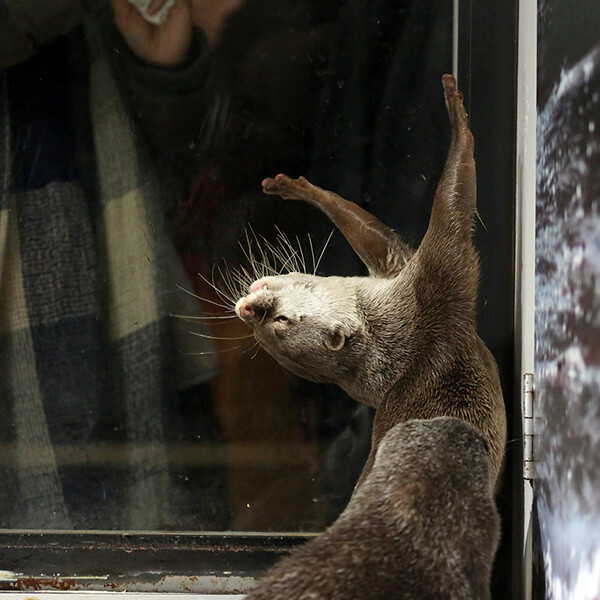 This weekend’s Open Thread is hosted the most dramatic of dramatic otters [via The Daily Otter]. My right ankle has a sad. A preposterously enthusiastic fellow at our friends’ band gig last night pulled me on to the dance floor, which I didn’t mind at first, but I was really expecting just a bit of crumping, and then he tried doing spins, which platform shoes aren’t really designed to cope with. I did surprisingly well for a while, but then I felt the shoe start to turn over, and went with the fall (onto nice thick soft carpet, which also was not helping the spins) hoping to save the ankle. Thought I’d got away with it for a while, but then I got up to go to the loo, and realised that I did still have a sprain. Spent the rest of the evening with an ice pack, dancing in my chair. Seems like it’s only first degree, so I should be alright in a coupla days, but still botheration. Lauredhel, hope your boys have more energy today after a good night’s sleep. Yay for reunions! Aphie, commiserations on the knee. Jo, does one have to take books in as well as give them out? I’m currently decluttering my bookshelves (and remembering that I’ve still got one of yours to return! ), so quite keen to give a few away but not take more in. I have to go to the physio on Tuesday, for the first time in my life. A little too much love from my work kids has resulted in a knee with almost no supporting cartilage, apparently. It’s quite painful, and anti-inflammatories are my friends. In somewhat more cheerful news, if anyone wants free books, they should check out Shellyrae’s post at Book’d Out explaining the 2015 Australia Day Book Giveaway Blog Hop and offering up two books herself. Non-Australian residents are eligible for many of the giveaways, and entries close midnight Tuesday 27 February AEST. We’re building up to a huge declutter here, even taking a week off work for it once the weather cools down a bit (so, March). Giving stuff away/selling it a few pieces at a time is not cutting it any more, it’s time to go full on. I think my books will go to one of the Lifeline book dropoffs. I’m hoping to go down to 50cm or less linear space of adult books. Otherwise, things here are mostly about hanging in until school starts. Because my son is actually starting school for the first time, he has one additional week of holidays yet while all the bigger kids go back. Then we can settle into new routines. Oh, haha, it is a giveaway of new (I assume) books to people who enter on the various participating blogs – not, unfortunately, a way to get rid of books. So, Rosie Batty is Australian of the Year. Jackie French won the Senior category. I should add, the other winners are Drisana Levitzke-Grey (Young Australian), a Deaf Australian who, among other things, was the first Deaf/deaf Auslan user to be a juror, and Juliette Wright (local hero), founder and CEO of GIVIT. I had my fingers crossed for Rosie Batty, but I honestly thought they would give it to Deborra-Lee Furness. I spent all this morning gardening. I haven’t touched the garden much since before Christmas and I almost filled the green waste bin with weeds. Then I put in some seedlings, so hopefully we will have late summer flowers. Then I spent the whole afternoon playing Skyrim. Now I hurt all over. There was a nice mini-display of precious objects from this year’s nominees at the National Museum of Australia, today. Was also really really pleased to see all the female faces… guess Peta Credlin’s been doing overtime to try to rejig Mr Rabbott’s public image? Vibes for the knee, Aphie, and the ankle, tigtog. It seems much less likely today, post the knighthood announcement, that the PM’s office has the kind of motives people were generously suggesting here! I’ve been sticking to my previous coping mechanism of dropping a silver coin into a jar whenever the government or the PM does something particularly daft or annoying. I’m up to $11.40 so far, and January hasn’t even finished. I am still boggling at the knighthood thing. Boggling. How could anyone even..? Boggling!